Since the dawn of the Entrepreneurial Space Age in 2009, nearly $11B in equity financing has been invested in more than 200 companies. Space Angels was founded in 2007 and has been a part of this journey since the beginning. We have experienced this incredible growth first-hand and have seen a variety of technologies developed and deployed in manners that are disrupting existing markets and creating entirely new ones. From the miniaturization of satellites, to inflatable habitats, laser communications, 3D-printed rocket engines, Space is quickly becoming a dynamic economy. To better understand the structure, dependencies and opportunities across space, we developed the first comprehensive market analysis to segment the key industries and provide clarity into the investment landscape for each. 1. Terrestrial businesses are those which create value on Earth and the near-Earth orbits (LEO, MEO, GEO). This is the largest and most mature market and the primary driver of new technologies for developing other space geographies. Currently, there are three broad industries that comprise the Terrestrial space market: Launchers & Landers, Satellites, and Media & Education. The Satellite industry is the most mature with more than 100 companies receiving total equity investments of nearly $5B since 2009. Over that same time horizon, there have been over 60 exits, returning more than $20B dollars to shareholders. Growth in this industry is being driven by the nanosatellite revolution and the miniaturization of electronics as the smartphone industry has matured. Companies like Planet are proving that dynamic and profitable space business can be built. For the first time in history, we have an image of every corner of the Earth updated on a daily basis, thanks to Planet’s constellation of small satellites. Accion Systems is developing ion propulsions systems for satellites that will increase their up-time, extend useful life and grow the return on investment for satellite operators and their shareholders. 2. In-Space businesses provide products and services that are creating value in the region of space between celestial bodies. This emerging market currently consists of cis-lunar orbit and the deep space regions between asteroids and Mars. There are four industries currently taking shape in this market: Biosphere, Industrials, Logistics and Information & Research. The Biosphere segment has attracted the most investment, totaling $500M across more than 40 companies since 2009. Bigelow Aerospace is the most recognizable company in this market. Earlier this year the company successfully deployed the Bigelow Expandable Activity Module (BEAM) on the International Space Station and has plans to place a similar biosphere in lunar orbit by 2022. Companies like NanoRacks are already developing In-space logistics and manufacturing capabilities that will accelerate the growth of this market over the next decade. 3. Planetary businesses are adding value through similar activities as the Terrestrial and In-Space markets, but are adapted to meet the needs of the unique planet or other celestial body and its inhabitants. To provide further clarity, the products and services of these businesses will be consumed on the surface the Moon or Mars to create a local economy. We have chosen to keep this market in aggregate given that it is in the early stages of development with less than five companies securing equity financing of $80M since 2009. Over time we expect to see unique markets develop on the Moon and Mars with industries that are likely to include and Planetary Launchers & Landers, Industrials, and Biosphere. 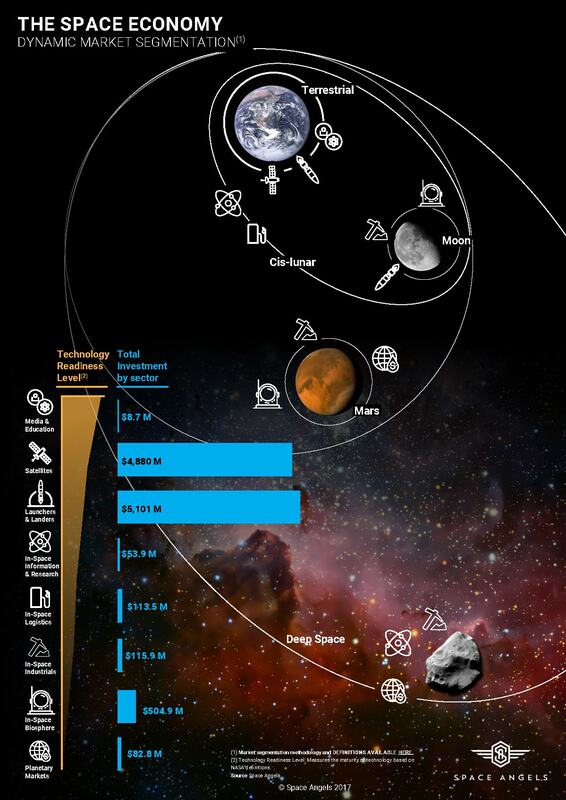 Currently, NASA is paving the technological pathway to achieve such visionary goals, but businesses like SpaceX, Planetary Resources and Astrobotic have similar ambitions and are already generating revenue along the way. 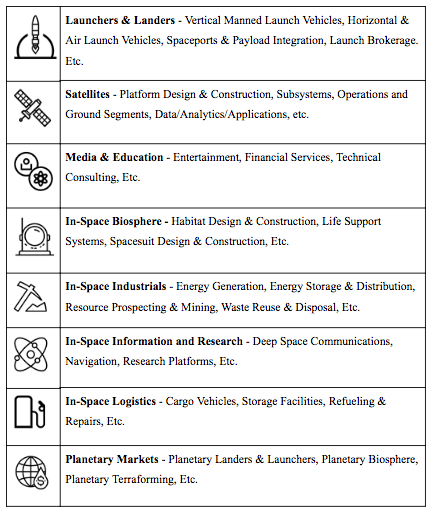 We know this is a lot to wrap your head around, which is why we have developed a map of the space economy to integrate all of these concepts! This will be a dynamic tool which we will include in our new market intelligence report released on a quarterly basis. Our goal is to help you understand the structure of the space economy, where resources are flowing and what opportunities exist to generate return and impact. Today, space investing has evolved from a high-risk passion for a few visionary investors, to a sophisticated and deliberate investment thesis by the world’s leading investors. This boom is not from one or two space companies raising a billion dollars, like we have seen in the late 90’s. It is now hundreds of companies across multiple industries, fueled by tens of billions in private capital. This suggests a robust and lasting foundation for growth. Space Angels has invested in more than 30 space companies and we provide the experience and tools for you to participate in shaping the Entrepreneurial Space Age. If you’re ready to start investing in private space companies, we invite you to apply for membership at spaceangels.com.